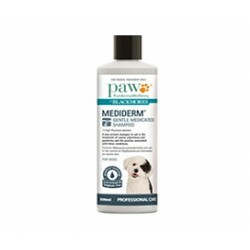 PAW MediDerm Gentle Medicated Shampoo is the Gentler, Faster, Safer and Effective Way to treat skin infections with the new veterinary active, Piroctone Olamine. Controls Staphylococcus intermedius and Malassezia pachydermatis. Removes scaly skin and grease. 1. ARTG Listed Active Ingredient. 2. APVMA Approved Active Constituent. 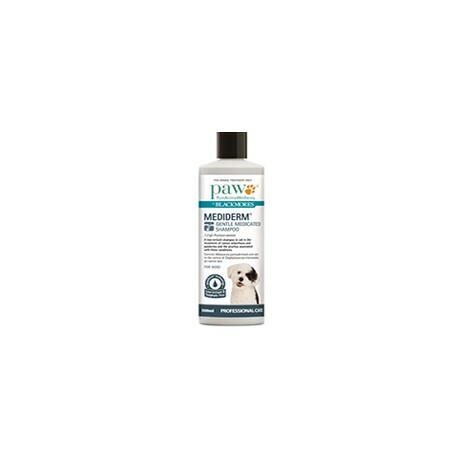 PAW MediDerm Shampoo combines Piroctone olamine, a new veterinary antibacterial and antifungal ingredient, with pawDerm surfactant cleansing technology, glycerin (vegetable), sodium phosphate, glyceryl laurate and aqua (purified Australian water). This is a Nutrient Rich Formulation which includes moisturising ingredients for improved performance. The formula has a creamy colour & light texture and is designed to nurture & moisturise the coat & skin. What caused my dog to react to its old dog shampoo and conditioner? Two of the major causes of skin reactions to topical shampoos are harsh surfactant ingredients (cleaning agents) and artificial (synthetic) fragrances. They can result in skin irritation, drying, dandruff, itchiness and even hair loss. Sulphates are the most commonly used surfactant (cleaning agent) in human and animal products as they are effective cleansers and very low cost. However they are also strong irritants. The two primary sulphate surfactants used in most products are Sodium Lauryl Sulphate (SLS) and its ethoxylated equivalent Sodium Lauryl Ether Sulphate (SLES). Both cleansers are made by “sulphating” palm oil. Pure Animal Wellbeing recommends avoiding products containing SLS and SLES because of the irritancy and the presence of “objectionable trace impurities”. SLS has also been shown to cause the skin to become more sensitive to other ingredients and irritants. Artificial (synthetic) fragrances are another major cause of irritation to the skin. Pure Animal Wellbeing only uses 100% Botanical fragrances and essential oils to provide skin friendly, natural fresh scents pleasing to dogs and humans alike. This product really works. After just one wash my dog's skin looks better and smells less.